is one of the biggest providers in Europe of in-store credit and invoice based payment solutions for the ecommerce sector. The company enables the end-consumer to order and receive products, then pay for them afterwards. Klarna assesses the credit and fraud risk for the merchant, allowing the merchant to have a zero-friction checkout process – a win-win for the merchant-customer relationship. Working with Google Analytics Certified Partner Outfox, Klarna found exactly what it needed in Universal Analytics, which introduces a set of features that change the way data is collected and organized in Google Analytics accounts. In addition to standard Google Analytics features, Universal Analytics provides new data collection methods, simplified feature configuration, custom dimensions and metrics, and multi-platform tracking. In Klarna’s new cookieless approach, the “storage: none” option was selected in creating the account in Universal Analytics. The checkout iframe meanwhile uses a unique non-personally identifiable ‘client ID’. These measures cause Universal Analytics to disable cookies and instead use the client ID as a session identifier. Because no cookies are in use, browsers that don’t allow for third-party cookies aren’t an issue at all. Virtual pageviews are sent on checkout form interactions. Custom dimensions and metrics are used for tagging a visit, with a dimension indicating which merchant is hosting the iframe, and a metric showing what cart value the user brings to the checkout. With Universal Analytics features, Klarna ensures iframe tracking is complete across all browsers. By using the virtual pageviews as URL goals and funnel steps, goal flow visualizations are used to find bottlenecks in the checkout flow. The new custom dimensions and metrics together with ecommerce tracking mean that reports can now be set up to reveal how each merchant’s cart value correlates to its final transaction value. Be sure to check out the whole case study here. Klarna is one of the biggest providers in Europe of in-store credit and invoice based payment solutions for the ecommerce sector. The company enables the end-consumer to order and receive products, then pay for them afterwards. Klarna assesses the credit and fraud risk for the merchant, allowing the merchant to have a zero-friction checkout process – a win-win for the merchant-customer relationship. Content Grouping allows sites to group their pages through tracking code, a UI-based rules editor, and/or UI-based extraction rules. Once implemented, Content Groupings become a dimension of the content reports and allow users to visualize their data based on each group in addition to the other primary dimensions. We’ve been hard at work refining Content Grouping based on tester feedback to create a simplified experience that has been unified with the familiar Channel Grouping interface. Content Grouping supports three methods for creating groups: 1) Tracking Code, 2) Rules, 3) Extraction. You can use a single method or a combination of all of them. This will help you wrangle those long lists of tens, hundreds or thousands of URLs, most of which have a tiny portion of the pageviews (or entrances, exits, etc) each one being individually not interesting, but together telling a meaningful story. We would like to help you grasp and represent this data in a grouped format, helping you understand the overall areas that the website owner has (e.g. “product pages”, “search pages”, “watch pages”). Content Grouping lets you group content into a logical structure that reflects how you think about your site. You can view aggregated metrics by group name, and then drill in to individual URLs, page titles, or screen names. For example, you can see the aggregated number of pageviews for all pages in /Men/Shirts rather than for each URL or page title, and then drill in to see statistics for individual pages. Be sure and visit our Help Center to learn how to get started with Content Grouping today. Viewing your site content in logical groups is important for sites and businesses of all types. It lets you understand how different categories of products are working together and the buckets that generate the most revenue. Or, if you run a news site understand which categories are the hottest and most in demand. Some of you have been analyzing these things in the past via Advanced Segments but we want to make this even easier and more useful across the product. That’s why we’re excited to launch Content Grouping. Benjamin Mangold, Director of Digital & Analytics at Loves Data, a Google Analytics Certified Partner. Earlier this year, the team at Loves Data used Universal Analytics and the Measurement Protocol to measure their caffeine consumption and tie it to the team’s productivity. Our next challenge: measuring our team’s movement into Google Analytics. With the help of an Xbox Kinect, movement recognition software, and of course the Measurement Protocol, we started getting creative! Once you have tied your online and offline data together you can begin to analyze the full impact of your different touch points. For example, if you are collecting contact details online, you can use Google Analytics to then understand who actually converts offline, whether this conversion is attending an information session or making a purchase at a cash register. The analysis possibilities made available by the Measurement Protocol are truly amazing. The following is a guest post by Benjamin Mangold, Director of Digital & Analytics at Loves Data, a Google Analytics Certified Partner. That's what Joe Meier of Baby Supermall told us recently. If you're looking for alphabets or monkeys on your new baby bedding, Baby Supermall is the place to be. But those products have an unusually long buying cycle. "Our typical customer is a pregnant mother-to-be," says Meier. "They have months to make a decision." In this video, Meier describes how Google Analytics’ attribution modeling tool let them measure the impact of different marketing touch points before customers finally made a purchase. So they could figure out which of their marketing activities led all those moms (and dads) to visit the Baby Supermall site. It also saved him from the monster 80-megabyte spreadsheets he'd been building as he tried to manually figure those patterns out. Result? “We’re spending our money more efficiently than we were before. We know what we’re getting for it,” says Meier. By linking their Google Analytics and Adwords accounts, Baby Supermall was able to see the impact of different keywords and optimize their AdWords ads, bringing in “tens of thousands of dollars in additional sales every week." Fairmont is famous for its nearly 100 global luxury hotels, from the original Raffles Hotel in Singapore to the grand Empress Fairmont in Victoria, B.C. The variety of the properties can make social impact tricky to measure, says Barbara Pezzi, Director of Analytics & SEO. Charmingly direct, Pezzi says her team tried other social media analytics tools and found that "the metrics were really lame. Number of likes and retweets — that didn't really tell us anything." They wanted to know exactly who they were attracting and how. Once the Fairmont team began using Google Analytics, they were able to see their audiences more clearly and tailor messages to fit. The results were impressive: a doubling of bookings and revenue from social media. "It was a big revelation for everyone" — when it comes to analytics, those are the magic words. Learn more about Google Analytics and Google Analytics Premium here. How do you improve social messaging for some of the world's most prestigious hotels? If you're Fairmont Raffles Hotels, you turn to Google Analytics. Loves Data, a Google Analytics Certified Partner. Creating custom Google Analytics Dashboards is a great way to monitor performance and get quick insights into the success of key aspects of your websites and mobile apps. You can create dashboards to meet your particular needs, from understanding marketing campaign performances, to content engagement levels, and even trends relating to goal conversions and e-commerce transactions. The dashboards you create will depend on who is going to use them. You will want the dashboard used by your marketing manager to be different to the dashboard that is seen by your technical team - and different again for your CEO. You should always tie dashboards to the types of questions the particular person or stakeholder is going to ask. Basing your dashboards on particular roles or job functions within your organisation is a good place to start thinking about the type of dashboards you will want to design. 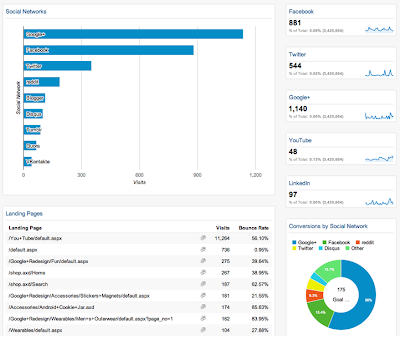 Each dashboard is made up of widgets which can be pieces of information or data from your Google Analytics reports. There are a number of different widgets and the ones you add to your dashboard will depend on the type of trends and insights you want to provide. Metric widgets present a single piece of data on your dashboard along with a small sparkline. Timeline widgets give a detailed sparkline showing trends by day. This widget allows you to show a single metric or compare two metrics. Geomap widgets allows you to display a map within your dashboard. You can show the location of your visitors and even compare conversion rates or engagement by geographic location. Table widgets display a table that combines information (a dimension) with up to two metrics. Pie widgets present a pie or doughnut chart and are useful for visual comparisons. Bar widgets are also useful for presenting comparisons. This widget allows you to pivot by an additional dimension and switch between horizontal and vertical layout. In most cases you will want to use the ‘standard’ widgets. These present data that has been processed into the standard reports. You can also include ‘real-time’ widgets, but it is important to know that these will not be included if you are exporting or scheduling the dashboard. Filters can be applied to widgets within your dashboard, allowing you to further define what is presented in your dashboard. For example, if you want to include a metric widget to show the total number of visits from your Google AdWords campaigns, you could then add the following filter which will only include visits where the source is ‘google’ and the medium is ‘cpc’. Once you have created your custom dashboards you can keep these private, share the dashboard with everybody who has access to the reporting view or even share them with the wider Google Analytics community. The Google Analytics Solutions Gallery is a crowdsourced collection of customizations and includes a number of great dashboards that you can add to your account. Have a great dashboard? Want to win prizes? Loves Data, a Google Analytics Certified Partner are running a competition for the best Google Analytics Dashboard. Judges include Google’s own Justin Cutroni, Daniel Waisberg and Adam Singer. The competition closes on December 31, 2013 and winners will be announced in late January 2014.